Background: Laparoscopy requires a reliable light source to provide adequate visualization. However, thermal energy is produced as a by product from the optical cable. This study attempts to quantify the degree of thermal damage secondary to the fiber optic light source. Temperature variation at the tip of the optical cable was examined also. Methods: Using a digital thermometer, temperature measurements were recorded at the tip of the optical cables from five different light sources (Karl Storz, Tuttlingen, Germany). Temperature measurements were recorded with new bulbs in the light source and from the tip of the optical cable using varying distances. The tip of the cable was applied to surgical drapes and the time to charring of the drapes was recorded. Subsequently, the tip of the optical cable was applied to the skin of anesthetized pigs and tissue samples were obtained after exposing the tissue to varying amounts of time (5s, 15s, 30s, 60s, and 90s). Sections of the damaged tissue were fixed in 10% formalin and paraffin blocks were prepared. 5mm sections were stained with H & E and microscopically evaluated. Parameters for thermal injury included extent of epidermal, dermal and subcutaneous fat injury and necrosis. The lateral extent and depth of injury were measured. Least squares means and Pearson correlation coefficients were used for data analysis. Results: The maximum temperature at the tip of the optical cable varied between 119.5 degrees and 268.6 degrees Celcius. The highest temperature reading was at the tip of the cable with a fresh bulb. When surgical drapes were exposed to the tip of the light source, the time to char was 3 to 6 seconds. The degree and volume of injury increased with longer exposure times. Significant injury was also recorded with the optical cable 2 mm from the skin. 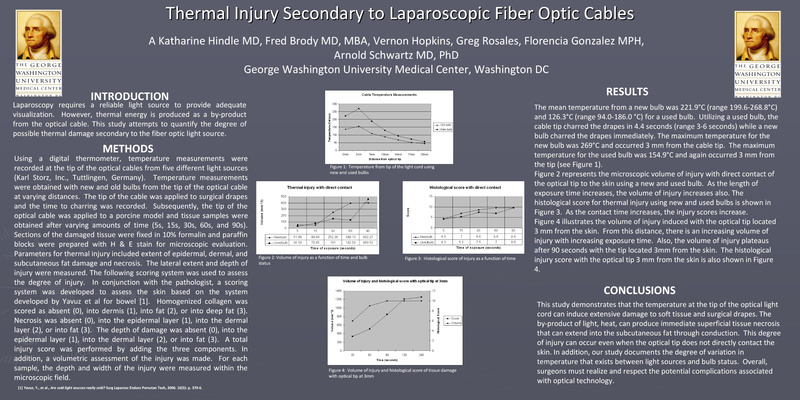 Conclusions: This study demonstrates that the temperature at the tip of the optical light cord can induce extensive damage to soft tissue and surgical drapes. The product of light (heat) density and time can produce immediate superficial tissue necrosis that can extend into the subcutaneous fat through conduction. This degree of injury can occur even when the optical tip is not directly touching the skin. In addition, our study shows the variation in temperature that exists between light sources. Overall, surgeons must respect the potential complications associated with optical technology.